Not every game ages well. Graphics grow outdated, and stories can easily reveal their age with old jokes or references. But somehow, there are games that transcend their creation date and find themselves enjoyable no matter the month or year. I predict Russian Subway Dogs will be one of those games. 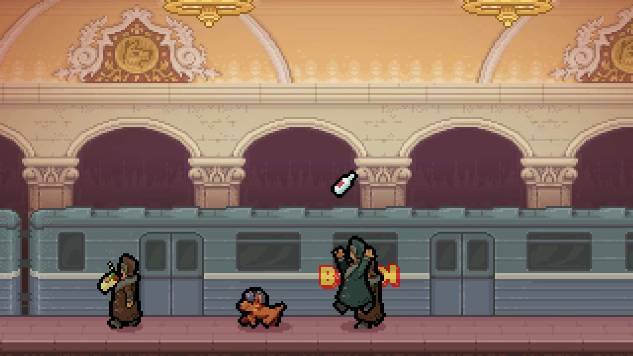 Russian Subway Dogs is a fun, fast-paced arcade game about stray dogs who enter the subway in search of food. The hungry dogs must bark at unsuspecting travelers to get them to drop whatever treats they might be holding onto. The game is inspired by the real-life stray dogs that actually use Moscow’s subway system to traverse the city on their own. It’s no surprise that animals are smart; cats rescue little children from dangerous animals, pigeons learn how to cross the street, and rats carry pizza down a set of stairs. Finally, we have a game that honors the tenacity and courage of the animal kingdom. But Russian Subway Dogs isn’t good just because of its street-smart animals. It’s a great game because of its simplicity. It follows the arcade game genre perfectly, starting off with one enemy and one incentive, and gradually increasing the risk and reward with each new subway stop. The character designs are repetitive in the classic arcade way. The screen can be riddled with the same fur coat-wearing, shawarma-eating commuters and I’d never tire of them, because each commuter is another chance to get a long chain in eating food and dodging explosive vodka and aggressive subway bears. The wild thing about the game is that it gave me pangs of nostalgia for an era that it wasn’t even born in. Every time I played, I lamented my use of an Xbox 360 controller. Russian Subway Dogs is an arcade game through and through, and it’s such a shame I can’t play it in an arcade, twisting the joystick left and right until my hunger eventually overtakes me and my coins. Perhaps the most fun part of the game is its unlockable characters. From KC Green’s Question Hound to Uay Chivo from Guacamelee!, Russian Subway Dogs pays homage to the cartoon animals all thriving in other games and artforms. There’s a bit of camaraderie in its nod to other games, particularly other indie games, who no doubt must compete for attention and money. But in the end, we all must work together so that we can all rise—or in this case, so that we can all eat some hot food. Another thing it borrowed from the arcades: this game is difficult! Opening up new subway lines requires players to complete specific challenges. The game is extremely creative in how it keeps players on their toes by slowly deviating from its initial “bark for food” premise. Like a classic arcade game, Russian Subway Dogs is doing its hardest to make you lose, and it’s your job to make sure no animal starves. I can see Russian Subway Dogs being the new game I play when I’m itching to get my fingers active and looking to improve my score. Some games will get lost to time and technical advancements. I hope Russian Subway Dogs is a game that can gracefully slip between time and simply be a good game in ten or twenty years. Its chaotic simplicity is what makes it so fun, and so easy to go back to every day. And just like the game, animals will always show their genius sides, and we as humans will always marvel at the wonder of the animals we’ll never completely figure out. Russian Subway Dogs was developed and published by Spooky Squid Games. Our review is based on the PC version. It will also be released later this year for PlayStation 4, Vita and Xbox One. Shonté Daniels is a poet who occasionally writes about games. Her games writing has appeared in Kill Screen, Motherboard, Waypoint and elsewhere. Her poetry can be seen at Puerto del Sol, Baltimore Review, Phoebe, and others literary journals. Check out Shonte-Daniels.com for a full archive, or follow her for sporadic tweeting.